Are ultrasounds safe? 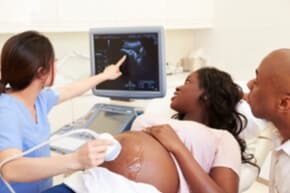 Here is an informative article explaining the benefits and risks of ultrasound. Ultrasound is used routinely and considered harmless by the medical profession, and for this reason risks are not discussed. In fact, it is presumed that use of ultrasound and the information it provides is considered valuable and desired by every woman. As with many of the tests and procedures during pregnancy, consider the risks, benefits and implications of the test.